Malvern priory, an ancient building with a monastic past, is a wonderful setting for a concert. 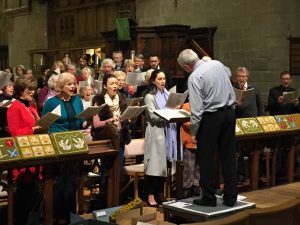 On Saturday 3rd February 2018 about 250 people poured into the church, filling every available space, to listen to music sung by ‘Malaika Voices’. Malaika is a Swahili word which means ‘angel’. The concert was dedicated to the memory of Susan Cosker, a palliative care nurse who worked in hospices in Kenya. Iain Sloan, former director of music at Malvern College, had brought together an astonishing amount of talent, and we enjoyed music ranging from a traditional Zulu song ‘Siyahamba’ to ‘Cymru Fach’ (dearest Wales), and classical favourites such as Handel’s ‘Zadok, the Priest’. Thank you – thank you to Iain and Gwyn Sloan, who organised this event, and are both long term supporters of Hospice Care Kenya. Thank you to all the amazing soloists who sang for us, and to the choir, who met for the first time at the afternoon rehearsal! 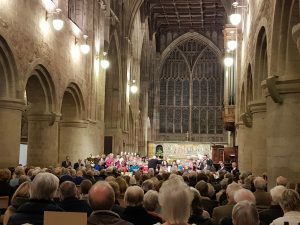 The concert raised over £5,000; a very impressive total! Due to generous sponsorship, and the gift of time from many supporters, all the money raised from ticket sales and donations will go to support our work in Kenya. We thoroughly enjoyed the concert, to which we were taken by our daughter who teaches at Malvern College and so knew many of both singers and audience. We were so pleased that it was so well attended, and would love to know how much it made for this excellent cause. Thanks for your comment; we’re really pleased you enjoyed the concert. It was a wonderful evening and we’re grateful to everyone who took part or came to watch. We’ll certainly let you know the grand total!